Dîner en Blanc - Paris World - F.A.Q. You don't live in France and wish to travel to this year's celebration of the 31st edition of Le Dîner en Blanc in Paris? You are in the right place at the right time! Once again, Le Dîner en Blanc de Paris invites its international community to join in and live the original French experience. Le Dîner en Blanc de Paris 2019 is a separate entity to Le Dîner en Blanc Paris-World. Le Dîner en Blanc Paris-World will not be responsible for the production and execution of Le Dîner en Blanc de Paris 2019. The sole purpose of Le Dîner en Blanc Paris-World is to coordinate and help the international community participate in Le Dîner en Blanc de Paris 2019. Let’s start with the basics… What is Le Dîner en Blanc? Le Dîner en Blanc is a much-anticipated annual event, the location of which is only revealed at the very last minute. Thousands of people, dressed all in white, and conducting themselves with the greatest decorum, elegance, and etiquette, all meet for a mass “chic picnic” in a public space. What makes Le Dîner en Blanc de Paris different from all other Le Dîner en Blanc events? Since its creation, Le Dîner en Blanc de Paris has been defined as an unusual "gathering" and not a formatted "event". First, it does not receive any official authorization, except for the good will of the authorities. This tolerance is the result of 30 years of history, an impeccable organization, a respect for the event locations, a show for thousands of passers-by, and the behaviour of participants as elegant as they are disciplined. Furthermore, Le Dîner en Blanc de Paris is free for Parisians who manage to receive an invitation. The happy few receive an invitation from a member of the organization. Being invited to Le Dîner en Blanc de Paris is a prized opportunity. I have already participated in a Le Dîner en Blanc in my city. Should I expect a similar process? Le Dîner en Blanc de Paris sets itself apart from other international events in many ways. Participation to the Parisian Edition offers a very different experience. For the international guests, which are used to a more structured organization, it is important to put yourself in a positive frame of mind, one that will embrace “imperfections” and, in all likelihood, spontaneity! But hey, aren’t these amusing and unexpected situations the ones that provide some of the most beautiful memories over time? Is there a risk of being bothered by the authorities while participating in Le Diner en Blanc de Paris? In its 30 years of history, the authorities have never interfered with this gathering. The first editions certainly raised questions, even some concerns. However, time and the disciplined organization of the 30 previous editions have helped it garner the international reputation it is known for today. ●	Guests commit to attend, rain or shine, no matter the circumstance. ●	Exude Elegance … in white. Originality is encouraged, as long as it remains elegant and tasteful. ●	Bring your own table, chairs, and picnic basket. ●	Follow the Volunteer Leader’s instructions. ●	Arrive and leave with your Leader. Nobody arrives at the site on their own. ●	Drink responsibly. Champagne or wine only. No spirits or beer. ●	Clean up: Take all your garbage with you and clean the area around your table. If you do not comply with any of these rules, you will no longer be able to register for future Dîner en Blanc events. Can I book my flight and hotel now? It is preferable that you buy your flight before registering for Le Dîner en Blanc de Paris. Registration is non-refundable, and renders your attendance, as well as your guest’s, mandatory. Should I travel with my equipment (table, chairs, etc.)? In order to facilitate logistics for international participants, tables, chairs, picnic baskets, champagne, wine, etc. will soon be available via Le Dîner en Blanc Paris World website. Please note that there will be no on-site distribution the evening of the event. You must pick up your order prior to the event at a central location in Paris. Please make sure to consider this in the planning your trip. Will you be offering catering baskets, champagne, or wine on your website? Yes, we will offer different options shortly. What will my participation cost? The participation fee to Le Dîner en Blanc de Paris is free for Parisian guests. However, to allow the coordination of the thousands of international guests, Le Dîner en Blanc Paris-World asks for a 30€ fee per person. Also, the usual International Membership fee (10€) will be charged by Dîner en Blanc International Inc.
How do I invite friends who wish to participate? Will we automatically be sitting together? The experience is always more enjoyable and memorable when we’re surrounded by our closest friends. To make sure you sit together, your friends will need to select the same departure point and Table Leader at the time of registering. Group changes will no longer be possible once registration is confirmed. Who will be my main contact in Paris? When you register, you will choose a Group Leader and a Table Leader. Your Table Leader will become your single point of contact throughout the preparation, the actual event, and will welcome you at the departure point. I do not speak French; is this a problem? All Volunteer Leaders supporting international guests speak and write English. Don’t worry about the language barrier; you will see that French people speak the language of Shakespeare very well … after a few glasses of wine! What means of transportation will be used to get to the site? Guests will get to the departure points on their own. The only means of transportation used will be by subway or by foot. Therefore, you must be in good physical condition to move and transport your equipment. A small cart is very useful to help carry your equipment easily that evening. What is the meeting time at the starting point? What is the itinerary for the event? We understand that this information is necessary to help you organize your trip. However, times are not yet confirmed. Plan to leave your hotel at around 5 p.m. to make sure you arrive at the meeting point at around 6 p.m. Your Leader will provide you with the exact schedule a few days before the event. Will the event be cancelled in case of rain? No, not unless there is a real safety risk for all participants. Le Dîner en Blanc takes place rain or shine. In case of rain, guests must bring a white or transparent raincoat/poncho and/or a white or transparent umbrella. But rest assured, in 30 years of Le Dîner en Blanc in Paris, guests have never been rained on! Can the event be cancelled? Will I be refunded? In the event of force majeure, if Le Dîner en Blanc de Paris has to be cancelled, fees and costs will not be refunded. If a situation that is out of my control prevents me from travelling to Paris, are my equipment and membership refundable? Registration to Le Dîner en Blanc de Paris is a real commitment. It is therefore not possible to cancel or be refunded once ticketed. In the event of a major unforeseen event that prevents you from participating, please inform your Table Leader as soon as possible so that they can find or help you find a replacement. However, it is your responsibility to find someone to replace you. If a participant misses the call without having made arrangements with their Table Leader, they will no longer be able to register for future Le Dîner en Blanc events. I have a major unforeseen event. Can I re-sell my spots? It is forbidden to resell your spots to a stranger or at a cost higher than paid. My guest cancelled; can I invite someone else? Yes, you can change the name and contact information of your guest without a problem. France’s legal age is 18 years of age. Therefore, all Le Dîner en Blanc de Paris participants must be 18 years old or over. Can I register if I am alone? No, registrations are always for 2 people. You will be sitting in front of your guest at your table. We strongly suggest that all guests take out personal and travel insurance. The organisations of Le Dîner en Blanc de Paris as well as Paris-World will not be held responsible for any loss, damage, or accident during the event. This document is a contract with significant legal consequences. I have been advised that it will affect my legal rights and will significantly constrain my ability to bring legal action against any of the Released Parties. I have read this document carefully before registering. I understand and agree that situations may arise during the course of the Event that are beyond the immediate control of any of the Released Parties (as defined below), including any such persons who may be present at the Event, and that I must not act or omit to act in any way at the Event in a manner so as to either endanger others or myself. I agree to comply with all instructions and all rules and policies established from time to time with respect to the Event, as the same are notified to me from time to time by the Host or its representatives or any other one of the Released Parties. I acknowledge that the Event may contain certain inherent risks, regardless of the care and precautions taken by the Host. I fully realize the dangers of participating in the Event and willingly and voluntarily assume full responsibility for my activity while participating in the Event and for all inherent risks associated with the Event, including, by way of example and not limitation: damage to or theft of property I own or the property of third parties; contact or collision with other persons or objects; broken, defective, inadequate or inadequately maintained equipment which belongs to me or a third party other than the Released Parties; unexpected failure of such equipment; the risk(s) of personal injury, accident and/or illness. Waiver and Release. In consideration of being permitted to participate in the Event, on my own behalf and on behalf of my heirs (whether testamentary or by intestacy), executors, administrators, legal representatives, assignees and successors in interest, I hereby assume full responsibility for my participation in the Event and, to the fully extent permissible under the law, waive, release, discharge, hold harmless, and covenant to indemnify and not to sue the Host, Diner en Blanc International Inc., Dîner en Blanc 30th Anniversary and their affiliates, and their respective directors, members, owners, managers, employees, agents, contractors, insurers and equipment suppliers, and any persons or entities whose property and/or personnel are used in connection with the Event (each of such persons and entities, a “Released Party”, and collectively, the “Released Parties”), from any and all rights and claims which I have, known or unknown, or which may hereafter accrue to me resulting from or in connection with my participation in the Event. Acknowledgement of Understanding. I have read this Agreement in its entirety and fully understand, and agree to be bound by, all of its terms. This website (the “Site”) is owned, managed and operated by Dîner en Blanc International Inc. ("DEB INT"). By accessing this Site and subscribing to the rights and/or privileges of Dîner en Blanc membership, you agree to be bound by these General Terms and Conditions of Use whether or not you have read them. If you do not agree to these Terms and Conditions of Use, do not access this Site. Your Dîner en Blanc International membership provides you with unlimited Internet access to DEB INT's password protected Site, from any location with Internet service. 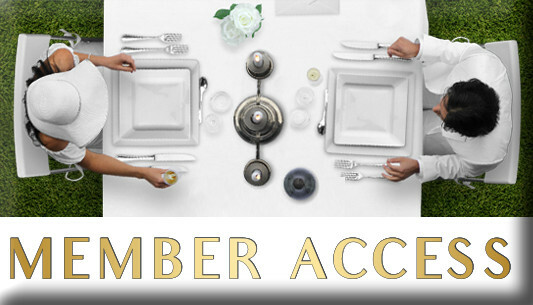 A Dîner En Blanc membership is a unique and effective tool that entitles you to manage all aspects of the local event that you will be attending. Some of the features may include: select your companion at your table; recommend another friend who can be invited to the event; communicate with his local organizers; mange seating arrangement; manage transportation to the event, purchase items from the store and subject to availability. PLEASE NOTE THAT EACH DINER EN BLANC LOCAL CITY EVENT IS HOSTED AND ORGANIZED BY A LOCAL EVENT ORGANIZER(S) WHOM OR WHICH IS ENTIRELY INDEPENDENT FROM DEB INT AND YOU MUST CONTACT YOUR LOCAL DINER EN BLANC CITY EVENT ORGANIZER FOR DETAILED INSTRUCTIONS. DEB INT IS IN NO WAY RESPONSIBLE FOR THE LOCAL EVENT AND ASSUMES NO LIABILITY OR RESPONSIBILITY FOR ANYTHING RELATED TO THE EVENT. The Dîner en Blanc event (including products and services ordered or purchased through this Site from any Vendor or participating business) are subject to local event city regulations, and availability of proper venue and proper seating arrangement. DEB INT makes no guaranty that the local organizer of the event will be able to accommodate all the requests made by you on the DEB Site nor is DEB INT in any way responsible for such requests. Membership offers expressly require a customer to provide their name, address, bank account or credit card information and email address, and agree to be billed at full membership rates unless the order is cancelled before the end of the verification period. Upon receipt of your order, Paypal will present you with a receipt. You can also download the receipt from your page on the Site. DEB INT reserves the right to refund all or a portion of subscription fees paid when, in its sole discretion and business judgment, it is fair and equitable to do so, as determined by DEB INT at its sole and absolute discretion. You agree that you will use your membership only for your own benefit. You may not transfer, assign, sell or lend your membership or rights to any other person. You agree to preserve and protect the privacy, secrecy and/or confidential nature of your membership number, and all personal identification information used in connection with your membership number, including credit card information, bank account information, user ID and password, your social security number, etc., DEB INT reserves the right to suspend your account if your user name has been compromised, or used on two or more different IP addresses at the same time or so close in time that you could not physically have been present at the access locations within that time period. You warrant and represent that through or as a result of the rights and access authorization provided by DEB INT, and/or related to DEB INT's vendors, marketing partners, or other members you will not use any computer, server, digital or electronic equipment or devise, computer program or software, digital signal, digital message or communication process, website, server, or the Internet to upload, post, e-mail or otherwise send or transmit any material that contains software viruses or any other computer code, files or programs designed to interrupt, destroy or limit the functionality of any computer software or hardware or telecommunications equipment. You also agree to not interfere with the servers or networks connected to DEB INT or to disobey any requirements, procedures, policies or regulations of networks connected to DEB INT. ANY ATTEMPT BY A USER TO DELIBERATELY DAMAGE THIS SITE OR TO UNDERMINE THE LEGITIMATE OPERATION OF THE SITE IS A VIOLATION OF CRIMINAL AND CIVIL LAWS; IF SUCH AN ATTEMPT IS MADE, DEB INT RESERVES THE RIGHT TO SEEK REMEDIES AND DAMAGES FROM THE USER TO THE FULLEST EXTENT PERMITTED BY LAW, INCLUDING CRIMINAL PROSECUTION. You acknowledge and agree that technical processing and transmission by or to DEB INT, including the information you enter, may involve transmissions over various networks and changes to conform and adapt to technical requirements of connecting networks or devices. Access to this Site and the availability of services, materials or documents from the Site is subject to interruption of access to the Internet caused by maintenance work, technical failures, or issues which may include interruptions beyond our control, such as your Internet access, technical failures associated or weather/power related outages. To the extent the interruption is caused by issues within our control, we agree to re-establish access to the Site in our sole and absolute discretion, to terminate your service and refund any unused portion of your current, monthly subscription fee. The yearly membership fee is subject to change by DEB INT without notice. DEB INT reserves the right to amend, modify and/or change any of the terms and/or conditions set forth herein at any time without notice. The effective dates of any amendments or modifications shall be posted on the Site and such modifications shall be effective as of the date of posting, Your continued access to the Site and/or use of your membership rights or DEB INT services will constitute your acknowledgment and acceptance of the modified or amended terms and/or conditions. DEB INT retains the right at any time (and from time to time) to discontinue, modify, temporarily or permanently terminate the DEB INT Site (or any part thereof) with or without notifying you. If DEB INT discontinues the site, DEB INT will not be liable to you or any third party for such discontinuance, modification or termination. Any dispute, controversy or claim arising out or in relation to these General Terms and Conditions and the matters contained herein, including but not limited to its existence, breach, termination or legal validity, shall be resolved by the parties in accordance with these provisions. Negotiation: The parties shall first seek to resolve the dispute by way of negotiation in good faith by persons with decision-making authority regarding the dispute and, if unable to reach agreement within 10 business days, the parties shall jointly initiate a mediation. Mediation: If the parties are unable to resolve the dispute through negotiation, the dispute shall be referred to mediation, by way of a single mediator jointly selected by the parties. The settlement of the parties, in writing and duly signed by all parties, is final and binding on the parties, with no rights of appeal, and shall be enforceable by the parties in accordance with contract law and any applicable legislation or treaties governing the enforceability of settlements reached through mediation. If the parties are unable to reach a settlement, the mediation is without prejudice to either party's right to demand Binding Arbitration. Binding Arbitration: If the parties are unable to resolve the dispute through negotiation and mediation, the dispute shall be finally and exclusively settled by binding arbitration in accordance with the rules set forth at section 940 and following of the Code of Civil Procedure (Quebec), by one (1) arbitrator jointly selected by the parties, or failing agreement, appointed by the court. The place of arbitration shall be Montreal, Canada and the English language shall be used throughout the arbitration proceedings. The arbitrator shall have binding authority to determine all issues arising out of this Agreement and to enter any legal, equitable or restitutionary remedy, including injunction and/or restitution. Fees and costs of arbitration shall be initially born by the parties equally. DEB INT and/or its business partners may present advertisements or promotional materials on or through the Site or Service. Your participation in any promotion, as well as your purchase of any product or service described in such advertisements or promotional materials, whether or not any such promotion or offer is linked or available through the Site, are subject to those terms and conditions contained or referenced within the promotional materials, web page, or website associated with such offer or promotion. Your participation in other promotions on or through the Site or Service is not required by the terms of this Agreement, but is subject to any terms and conditions stated in connection with such offer or promotion. You agree that DEB INT and the Diner en Blanc local city event organizers shall not be held responsible or liable for any loss of damage arising out of any other offer or promotion, and these Terms and Conditions of Use shall apply only between you and DEB INT with respect to your online access to the information posted on this Site. DEB INT may at any time, and at its sole discretion, modify these Terms and Conditions of Use, with or without notice. Amendments or modifications will be effective immediately upon posting. You agree to review these Terms and Condition of Use periodically and your continued use of this Site following such modifications will indicate your acceptance of these modified Terms and Conditions of Use. If you do not agree to any modification of these Terms and Conditions of Use, you must immediately stop using this Site. This Site may contain links to or references to third party Sites. These links are provided for your convenience only. No endorsement of any third party products, services or information is expressed or implied by any information, material or content of any third party contained in, referred to, included on, or linked from or to this Site. Any information, data, opinions, recommendation, products or services provided by such third parties through links to other Sites or otherwise made available through their Sites are solely those of such third parties and not of DEB INT or its Vendor. Your use of such third party Sites is subject to the terms and conditions of use and the privacy policies of such Sites. DEB INT and its payment processing affiliates have a zero tolerance policy for fraudulent transactions, including the use of unauthorized bank account or other billing information as payment for products and services. DEB INT will prosecute the fraudulent use of billing information to the fullest extent of the law. In the event of a claim of unauthorized billing or fraud, you agree to assist DEB INT in the timely and complete resolution of the claim, including where applicable the provision of other or additional billing information on your account. The materials displayed on or contained within this Site including, without limitation, all Site software, design, text, editorial materials, informational text, photographs, illustrations, games, audio clips, video clips, short features, artwork and other graphic materials, and names, logos, trademarks and service marks (the "Materials"), are the property of DEB INT or its licensors and are protected by copyright, trademark and other intellectual property laws. The Dîner en Blanc name, logo, business and marketing methods, web designs, graphics and related trade dress or marks (collectively the "Materials") are the intellectual property of DEB INT and/or its licensors. All rights reserved. You agree not to reproduce, modify, create derivative works from, display, perform, distribute, disseminate, broadcast or circulate any Materials to any third party (including, without limitation, the display and distribution of Materials via a third part Site) without express prior written consent of DEB INT. Use of Materials is only permitted with the express written permission of DEB INT. You further agree that you will not disassemble, decompile, reverse engineer or otherwise modify the Materials. This Section will survive the termination of your right to use this Site. This site, its contents, and any software, products, and services offered or contained herein are provided on an "as is" basis and on an "as available" basis. DEB INT makes no representations or warranties of any kind with respect to this site, its contents, or such software products and services, and disclaims all such representations and warranties, including, without limitation, for example warranties of merchantability and fitness for a particular purpose., non-infringement of third party rights, error-free or uninterrupted service, accuracy availability, reliability, security, currency and completeness arising from or relating to this site, its content or any links, any software, tools, tips, product or services provided through this site. in addition, DEB INT does not represent or warrant that the information accessible via this site is accurate, complete or current, price and availability information is subject to change without notice. In no event shall DEB INT, its affiliates, and any of their respective directors, officers, employees, agents or other representatives be liable for any direct, indirect, special, incidental, consequential, punitive or aggravated damages (including without limitation damages for loss of data, income or profit, loss of or damage to property and third party claims) or any other damages of any kind, arising out of or in connection with: (1) your participation in a Dîner en Blanc® event, and (2) the DEB INT Site andany materials, information, qualification and recommendations appearing on this Site; any software, tools, tips, products, or services offered through, contained in or advertised on this site; any link provided on this site; and your account and password, in each case whether or not DEB INT has been advised of the possibility of such damages. This exclusion of liability shall apply to the fullest extent permitted by law. This provision shall survive the termination of your right to use this site. You acknowledge and agree that you will be fully liable for all damages resulting directly or indirectly from your use of this site. DEB INT makes no warranty that the functions of the Site will be uninterrupted, secure or error free or that any errors on this site will be corrected. DEB INT and/or its affiliates assume no responsibility for (1) any problems relating to technical malfunction or delays of telephone networks or lines, computer on-line systems, servers, providers, computer equipment, or software, (2) failure of any e-mail to be received due to technical problems or traffic congestion of the internet, DEB INT sites, or any combination thereof. to the extent permitted by applicable law, DEB INT shall not be liable to you for any damages, losses, consequential or exemplary damages of any kind, including without limitation any injury or damage to your computer and/or any other computers or computer equipment as the result of downloading any materials relating to this site. You agree to indemnify and hold harmless DEB INT and its affiliates and their respective directors, officers, employees, agents or other representatives from and against all claims, liability and expenses, including all legal fees and costs arising from or relating to (1) your breach of these Terms and Conditions of Use; (2) your participation in a Dîner en Blanc® event and (3) your use of this Site including transmission or placement of information or material by you on this Site. This provision shall survive the termination of your right to use this Site.